The paper mainly focuses on Balochistan, the only western Province of Pakistan which shares direct border with Iran. Due to its geographical location the Province of Balochistan occupies a special place in the friendly relations and mutual collaboration between Pakistan and Iran, especially, in the context of socio-cultural and economic interactions. But, despite of its paramount significance in Pak-Iran relations, there are also certain discouraging and disappointing factors which are equally responsible for creating misunderstanding, doubts and tension in the friendly bilateral relations between these two countries. The paper addresses these factors which make this province a destabilizing factor in Pak-Iran relations. Pakistan inherited about 590 miles (909 km) common frontier with Iran. Pak-Iran boundary is known as Goldsmith line1 was partially demarcated runs from Koh-I-Malik Saih, the tri-junction of Pakistan, Iran, and Afghanistan to the Gwader bay in the Arabian Sea. Also, a common frontier region is inhabited by Baloch tribe which is linguistically, ethnically, culturally and traditionally is alike. The development of communication under the auspices of RCD and ECO further increased in the social and cultural interactions between these two communities. The geographical contiguity coupled with socio-economic contacts and racial affinities between the people of the two provinces has a positive and profound implications on Pak-Iran relations.Balochistan is one of the four provinces of Pakistan, which has a close geographical proximity with Iran. This province is one of the leading factors accountable for overall relationship between Pakistan and Iran. The geo-strategic location of Balochistan makes it the most attractive province for transit route to Iran The common border-line is responsible for the regular interactions between the Baloch communities living in Pakistani Balochistan and Seistan (Iranian Balochistan), and also the interaction between Hazaras community living in Quetta and Qum and the other major cities of Iran. The Baloch of Pakistani Balochistan and Seistan Balochistan of Iran have a similar customs and tradition. The strategic trans-national gas pipeline projects and construction of seaport, oil refinery and oil at Gwadar further increase the significance of Balochistan as an important energy conduit in the region. The paper is divided into two parts. The first part of the paper deals with the socio-economic interactions between the people of the two provinces i.e. 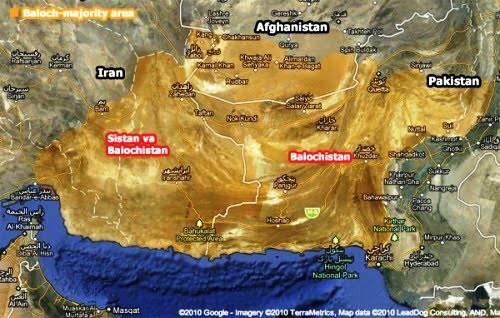 Pakistan’s Balochistan and Seistan the Baloch province of Iran. The paper focuses more on Baloch borderland interaction across Pak-Iran border. An attempt is made to highlight the role of Iranian Culture Center established in Quetta for the promotion and enhancement of cultural relations, especially, the exchange of visits of the professors, scholars, intellectuals, and students of the two Provinces for purpose of academic activities. The paper further describes Pak-Iran Joint Ventures and a common border market in the Province of Balochistan for the promotion of trade and commercial relations between the two countries. In the second part of the paper the auther discusses some of the challenges that make Balochistan as a destabilizing factor in Pak-Iran relations. The illegal trade and smuggling, drug trafficking, Jadullah organization, the sectarian crisis and the brutal assassination of Hazaras in Quetta and the adjoining border districts, and the growing competition between the Gwader and Chabahar are the main constraints which remain as a strong bulwark not only in the mutual interaction and close cooperation among the people of these provinces but, also has its adverse affects on the overall future relationship between these two friendly and brotherly neighboring countries. In the words of Dr. S.M. Burke, Pakistan’s abiding love for Iran also stems from the fact that Iran is the mother of Pakistani culture and Persian is the mother of our national language, Urdu. (Burke, 1973).Also, a common frontier region is inhabited by Baloch tribe which is linguistically, ethnically, culturally and traditionally are alike. (Abidi, A.H.H., August 1977).The Baloch living in Pakistani Balochistan and Seistan. Balochistan (Iranian Balochistan) have a similar customs and tradition e.g. Beggari,2 Divan3, Hashar4, Karchva-kapon5, Sepat6, Bagi Mayar7, and Mangir8. The major purpose of interaction between the two communities is the socio-cultural and economics. The existence of the boundary normally reduces the contacts between the people living on either side. The boundary between the Pakistan and Iran is not very soft but it is not very restricted compared to the Iranian border linking Turkey, Iraq and even Afghanistan. However, the establishment of custom posts or other check posts tends to restrict and scrutinized the bonafide of arriving and departing passengers. There are regular and irregular entry points, the major one near Taftan and Panjgur. There are a number of towns and villages where the houses penetrate both sides of the border. For example, the towns of Ridee and Balu in Turbat. There are five border districts predominantly inhabited by Baloch and Barhvi population. They are Panjgur, Chagai, Wasuk, Turbat and Gwader. Previously, Kharan was an important and largest district in the area wise, which bordered Iran. But after the formation of three new districts in Balochistan, there has been border demarcation. (Dawn, Karachi, November 12, 2005).The Baloch living on across the border have dual nationality. The people from the both sides of the boundary line frequently cross the border for various purposes which include the following. • Trade and business visits. The social visits include sight seeing, meeting with friends, and spending vacations there. These visits are common among the family members. Friends of the family members, often travel with them. Social visits are rampant in border towns. In normal life affecting business, social and cultural relations when the people of Iranian Balochistan and Pakistani Balochistan cross the border line for one reason, or the other, that does not possess the feeling that they are entering the foreign land. Of all kinds of traveling and visits cultural meeting stand unique. Cultural visits are arranged for very purposes namely burial ceremonies, participation in marriages and attendance in festivals and feasts etc. Invitation to attend these functions is send to all the relatives depending upon the financial status of the family, irrespective of their place of residence. Here the similarity of customs, traditions and rituals laid significant role in creating a sense of unity among the people of both sides. People not only take pains to travel even long distance to participate in the cultural meetings but also disapprove of people absenting themselves without any reasonable excuse. A gathering of people living in far off places but do not tied with blood, culture and history, is an occasion of joy and merriment. These links bring about full impact on the people living across the border in the time of any cultural event. Traveling and visits take place if they one the only going to the next village and not to the next country. Cordial and warm greetings are exchanged and return visits is either paid or promised. The festivals of Eid-ul-Fiter, Eid-ul-Duha and Eid-ul-Malad provide occasions for far and near relatives to spend some days together of livelihood. Visits to shrines to participate in annual Urs (anniversary) of Sufis in Seistan Balochistan are one of the sources of interaction between the two communities. There are many shrines but the three are more important whom Baloch pay homage. They are Pir Shorah in Seistiyari, Shazeni Pir and Rakal Shah at Chowkat. They spend two or three days to attend the shrines, also meet their relatives and friends and then returned back to their homes. The Baloch living across the borders have excess to Rahdar9. The basic qualification of the pursuit or Rahdari is that the person is local of the districts adjacent to the border and has either relatives or business across the borders. However, residents with passport are issued visa without any difficulty. In other words, the Pakistani Baloch with passport can receive visa without any difficulty from the Iranian consulate in Quetta and, similarly, the Iranian Baloch with passport form Pakistan consulate in Zhaidan. Both the sides stressed the need for close interaction and the exchange of teachers and students between the two provinces. The provinces of Seistan will provide techniques and experts for the modernization of irrigation system in the province of Pakistani Balochistan. Both the provinces will take joint and collective steps for the eradication of smuggling, illegal trade and drug trafficking. The governments of the two countries would provide maximum facilities and cooperation to travelers and visitors of across the border. The visa formalities for passengers would be relaxed.A proposal for setting of common Quetta-Zahidan chamber of commerce. Both the provinces will take necessary steps in the promotion of trade and business. The socio-economic dispute between the tow provinces would be settled by the joint cooperation of provinces themselves. Setting up of a Pak-Iran Common Border Market is under active consideration of the governments of the two countries. On the recommendations of Balochistan, the government has identified four places for setting up the proposed markets at the border. These areas include Taftan-Minjaveh, Ladgashtjalaq, Parome-Kuhak, Mand-Peshin and Santsar-Nobandan.The motive behind establishment of a common border market is to sell goods at concessional rate of customs duty and other taxes for controlling growing cross border illegal trade between Pakistan and Iran. Actually, a proposal for establishing common border market with Pakistan was moved by Iran on the pattern of other such markets already existing on the borders of Turkey-Iran, Turkmenistan-Iran and Azerbaijan-Iran. Since Pakistan did not have the experience of operating such markets in the past, a delegation consisting of representatives from Balochistan and other concerned organizations and commercial Counselor of Pakistan at Tehran had visited Iran in this regard. After the visit, Pakistan delegation was in agreement with the idea for establishing the border markets. There was a consensual rationale for setting up the markets that would promote legal economic activity in the border areas with a view to provide economic incentives to the people in these remote areas on both sides of the border. The people living across the border on both sides have little exposure to civic facilities especially, the educational facility. Normally the traders avoid in procedural obligations leading towards growing informal economy in that area. Being an arid area in terms of climate there is no concept of agriculture in these areas and the people have to depend on rain waters. In the face of hardships due to non-availability of adequate drinking water, the population is scarce which also discourage growth of industrialization in those areas. It is expected that setting up of common border market will eliminate smuggling, provide employment opportunities, strengthen cultural and historical linkages between the people of both sides having common traditions besides help promoting small and medium size entrepreneurship in the so far neglected areas. The government of Balochistan fully agreed with the idea of developing a common border trade market and has reportedly identified location as well where the proposed market would be more viable and easy to manage. A green signal has also been given by the Ministry of Food and Agriculture, Ministry of Industries and Production, and the Central Board of Revenue (CBR) for the idea for development of the border market. However, the Ministry of Petroleum and Natural Resources has reservations regarding expected revenue loss due to import of oil products and also raised apprehension on the import of low quality CNG cylinders. It may be pointed out that these products are easily flowing into Pakistan, especially, in the province of Balochistan, and, are being sold at a much cheaper rate as compared to the prices in the remaining parts of the country. Similarly, the CNG kits are the much sought after item in the urban areas of Pakistan these days as most of the vehicle owners are converting from oil to CNG system which must cost effective as compared to costly oil consumption. The proposed market is to be set up with an estimated cost of Rs105.405 million on experimental basis essentially to check increasing trend of smuggling and to provide employment opportunities to the local people living along side the border. In order to specify certain items to be allowed for trade in common border market, a trade delegation may visit Zahidan to study the common markets and get the first hand information of the area and its problems that might emerge in the process. The growing economic activity in that area would be certainly supported by the recent agreement between Pakistan and Iran through which people of the Makran area in Balochistan have received an additional electricity from Iran through a 132kv grid system. Power is being imported from Jakipur grid of Iran is now reaching Mand, Tumb, Turbat, Hoshab, Panjgur, and Pasni and Gwadar town of Balochistan. The import of electricity from Iran will facilitate over 26,500 consumers in that area. One of the significant developments which expanded the business and commercial ties between the two countries is the Pak-Iran Joint Venture Refinery will be built at Hub in Balochistan is a welcoming step. The proposed Refinery having hydro-caker and ‘Coker units’ will help reform imported crude oil from Iran into a high speed diesel has multi purpose use and is in much demand in the country, while the production of coke from the refinery and its use in Brick Klins in innovative idea which would help reduce dependence on the less environment friendly fuels. ( Pakistan Observer, Islamabad, January 17, 2003) The proposed venture will also go a long way in promoting economic cooperation between Pakistan and Iran, which suffered in the past few years because of the political misunderstanding between the two countries. This will provide an economic impetus to the least developed province in the country and offer an employment in the region where such opportunities are scare. Moreover, the refinery will help meet the growing demand of high-speed diesel. Balochistan will require 6 million tons of Iranian heavy crude oil and its project will help save 300 million US $ per annum in foreign exchange. It will also create thousand of jobs and help usher a new era of economic property and development in the province of Balochistan. In addition, another Joint Venture Pakistan-Iran gas pipeline project is one of the significant developments which can greatly help Pakistan to overcome its energy crisis. The future of the Iran-Pakistan-India (IPI) gas pipelines also lies in Balochistan.Its own resources of gas and oil are expected to be insufficient to meet the growing demand. By virtue of its energy resources and its location, it is key factor to the energy supply to the other provinces of Pakistan. The country’s mounting energy crisis and the growing demand for energy security in the region have magnified Balochistan economic and strategic importance. Balochistan is the only potential land route for the proposed $1.2bn pipeline. A major part — some 1,500km — of the 2,100km-long conduit which will connect Iran’s Pars gas field to Pakistan’s main distribution system in Nawabshah, will cross Baloch territory in Iran and Pakistan. ( Dawn, 23 March,2010).Pakistan’s production of oil is far less than its consumption, making it necessary to import 80 per cent of its requirements. Pakistan is gifted with abundant resources of natural gas, but the rate of extraction in domestic fields is not going to be adequate to satisfy future demand. ( Howard,2007)With Pakistan’s plans to lay more emphasis on natural gas for power generation, the pipeline project would have muli-dimential benefits. (Pandean, 2005). The supply of electricity from Iran is a boon for Pakistani borderland people who experience neither load shedding nor fluctuation. As compared to the past the Baloch are using more electricity. WAPDA was using and is still using diesel-run generators to supply electricity to border towns only for 5 to 10 hours a day. Iran is already supplying electricity through its 132KV line to Mekran coastal region, whose requirement is estimated at 17.5MW. The coastal region still relies on goods traded from Iran. The Iranian authorities proposed that a 132-kilovolt (KV) transmission line be laid between Mirjawa (Iran) and Dalbandin for Rs 1.34 billion and another 132-KV transmission line from Mirjawa to Dalbandin and Chagai via Nokundi for Rs 2.08 billion. WAPDA considered it too expensive for Pakistan. The authority submitted a new proposal to electrify the two Balochistan districts by laying its own transmission line from Faran Grid Station to Dalbandin for Rs 584 million. Pakistan is currently importing electricity from Iran at Rs 1.80 per unit for the Mund, Taftan and Mushkhail areas in Balochistan as there is no WAPDA transmission system there. Pakistan is importing 30 megawatts (MWs) for Mund, 1 MW for Taftan and 1 MW for Mashkhail. (QESCO handout, Head office in Quetta).The use of Iranian electricity by the border Baloch is a major source of jubilation as there is no load shedding there compared to other areas of Balochistan which remain plunged in darkness for long hours. The demand for Iranian electricity is growing in Kharan, Noshki etc that their areas also be hooked to the Iranian supply of electricity. Despite of its socio-cultural and economic significance of Balochistan in Pak-Iran relations as mentioned above, there are also certain discouraging factors which are equally responsible for creating misunderstanding, doubts and tension in the bilateral friendly bilateral relations between the two countries e.g. constraints and barrier at Pak-Iran border, the formation of Jandullah Organization, the brutal killing of Hazaras people, illegal trade, smuggling and drug trafficking, and the growing hostility and competition between Gwader and Chabahar the Pakistani and Iranian Ports respectively. Hasting Donnan and Thomas Wilson claim that “one can hardly open a book about orders without finding at least passing reference to smuggling and the clandestine movement of people and goods from one side of the national boundary to the other”. (Donnan, 1999). Illegal trade or smuggling across the border in Balochistan is a common phenomenon that hampered the mutual interaction and friendly cooperation between these two provinces. Illegal trade or smuggling can be defined as the form of trade across the borders, ports with strong collaboration between the smugglers and the local police and custom departments. The volume of such trade in a commodity is determined by the extent of differences in the consumer prices between two countries. It is due the high taxes and custom duties on export and import on commodity (agricultural and industrial goods). Other factors encouraging smuggling include time to time shortages of supply than demand of different commodities across the borders; undue protection provided to smugglers by the political elites, local administration, higher officials in bureaucracy; negligibly low level of real pressure from higher authorities responsible to control smuggling; weak, lengthy and corrupt process of awarding punishment to the arrested smugglers etc. The attractive bribes to the official of anti-smuggling agencies are one of the great obstacles in controlling illegal trade across the borders. Pakistan has its border with Iran on its south-western sides. Illegal transfer of commodities (both agricultural and industrial goods) to and from Pakistan to these countries is a regular phenomenon on these borders. The magnitude of illegal trade across Pak-Iran border greatly varies across sources in terms of quantities and the estimated money values and loss of public revenue. The issue of illegal border-crossing by Pakistanis is more complicated. Most of the people illegally crossing the border with aim to pass through Iran on their way to Europe, a region with substantially higher wages and benefits. The Iranian gasoline is a major item smuggled from Iran into Pakistan through the border. It is mostly illegal in which a chain of mafia, government officials, and local notables are involved. Smugglers use deserted tracks in Eastern Iran along the Pakistan-Iran border. It has become a major irritant for both governments, and creates obstacles for bilateral relations. The petrol is sold all over Balochistan, right from inside the Pakistan border to lower down to Punjab and Sindh. The major route of smuggling is from Iran through a number of dirt routes along the RCD and Quetta-Taftan international trunk road. There are different methods of smuggling. It is carried in oil tankers by the private and commercial vehicles in containers and trucks with big tanks tucked underneath. According to Customs sources, the private commercial trucks on the route are designed with special fuel tanks with capacity of around 500 liters. The smuggling of petrol is a source of interaction and a boon for those smuggling it. People living in the far-flung areas of Balochistan, particularly areas hit by drought depend on petrol smuggling as the source of livelihood. (Kundi, 2002). It is an insurgent Sunni Islamic organization based in Balochistan that claims to be fighting for the rights of Sunni Muslims in Iran. It was founded and is currently under the command of Abdolmalek Rigi. It is believed to have 1,000 fighters and claims to have killed 400 Iranian soldiers and many more civilians. It is a part of the Baloch insurgency in Pakistan and in Iran’s Sistan and Balochistan Province. The group started under the name of Jundallah and later renamed itself as the People’s Resistance Movement of Iran. The group has been designated a terrorist organization by Iran, which accuses the group of being behind numerous acts of terror, kidnapping and smuggling narcotics. Pakistan shares a 909 km border with Iran. Pakistan’s largest province, Balochistan, spans the harsh and rugged terrain of the entire Pakistan-Iran border. The Baloch area on either side of the border has always been volatile. Clashes between local leaders and anti regime elements with Pakistani authorities and the Iranian regime respectively, over autonomy, wealth distribution and the sheltering of insurgents, have risen dramatically during the past few years. Jundallah is closely linked to the Baloch nationalism in Pakistan, but unlike the Pakistani Baluchis claiming territorial separation, Jundallah does not seek secession or union with Pakistani Balochistan. (Wiig, 2009). Iran accuses the United States and other foreign elements of backing Jundallah, possibly from Pakistani territory with Islamabad’s support. In early 2007, in retaliation Iran closed the Pak-Iran border at Taftan and forced Pakistan to give up its support for Jundullah. The group had claimed responsibility for a bus blast in Zahedan in February 2007, in which 11 members of the Iranian Revolutionary Guards were killed. For the first five years, Jundullah operated in the Iranian province of Sistan-Balochistan, bordering the Pakistani districts of Chagai, Kharan, Panjgur, Kech, and Gwadar. Its leader, Mullah Malik Raiki, studied in a Pakistani madrassa in Mashkel, Balochistan, and has been living in Quetta and Karachi for many years now. Anti-Shia Pakistani organizations like the Lashkar-e-Jhangvi have also backed the Jundullah. (Zulfiqar, 2007). In December 2010 Jundollah took responsibility for an attack on a mosque in the city of Chabahar that left 38 people dead and 89 others injured. (Chasmilee, 2011).Iran has accused Pakistan of hosting Jundallah and has on several occasions attempted to seal the border to Pakistan in an act of retaliation. (Escobar, 2010).Iran also alleged Pakistan of not taking adequate steps to control Jundullah for creating friction between the two countries. While an successful attempt by Pakistani authorities to free 21 Iranian officials from the clutches of Jundullah in August 2007 has been attributed to Pakistan’s desire to gain some concessions from the United States. ( Zulfiqar, 2007). Although, the prevailing conspiracy thinking within the Iranian regime, these allegations may not be completely unfounded. (Harrison, 2009).Tensions between Pakistan and Iran intensified in response to the October 19, 2009 attacks against Iranian Revolutionary Guards in Sistan-Balochistan province. President Ahmadinejad publically accused “certain officials in Pakistan” of involvement in the attacks. (CBS News, October 19, 2009).Pakistani officials denied any involvement in the attacks, rejecting Iranian Interior Minister Mustafa Mohammad Najjar’s accusation that Jundallah received financial aid from Pakistan. (Dawn, 23 October,2009). Iran’s Deputy Foreign Minister, Hassan Qatari said Thursday that the Pakistani government should take serious measures to eradicate terrorist activities across the borderline of the two countries. “The Pakistani government is expected to fulfill its promises and to take more serious measures to root-out the terrorist and evil activities,” (Xinhuanet, 14 January, 2010).Pakistan’s relations with Iran deteriorated in the wake of an October 19 bombing during a conference meeting between Shiite and Sunni groups in South-eastern Iran. The attack resulted in the assassination of several senior commanders of Iran’s Revolutionary Guard Corps. (UPI, 14 January, 2010).An Iranian Foreign Ministry official said there is a hidden agenda behind the recent tragic events measures on Iran’s eastern borders with Pakistan and Afghanistan. (Press TV, 14 January, 2010, http://www.presstv.ir/detail.aspx?id=116139§ionid=351020101). Hazaras are a Persian-speaking people who mainly live in central Afghanistan. They are Shia Muslims and comprise the third largest ethnic group of Afghanistan, forming almost 9-18% of the total population. Over half a million Hazaras live in neighboring Pakistan (especially in the city of Quetta) and a similar number in Iran. Their number has rapidly increased after partition, particularly during the last two decades. In 1962, through legislation, the Hazara tribe was described as the citizen of Balochistan. The number of Hazara has dramatically exceeded after 1986, due to a massive migration. The Islamic Revolution of Iran had a profound influence on the socio-cultural development of this community. The Sour Revolution in Afghanistan resulted in the huge influx of Afghan refugees both in Pakistan and Iran. In Pakistan, most of the Hazaras live in and around Quetta, the capital of Pakistan’s South-western Province, Balochistan with prominent Hazara populations include Hazara Town and Mehr Abad. They have contributed to local trade, and possess key positions in the Government administrative services of Balochistan and the federal government. Hazaras are also politically active in Quetta and have their own political party known as the Hazara Democratic Party. The most notable figure of Hazara was General Musa Khan, who served as Commander in Chief of the Pakistani Army between 1958 to 1966. Beside this, Hazara historians and politicians played a prominent role in the upliftment of Hazara people in Pakistan. Hazara community in Pakistan has close and intimate relations with the Hazara community of Iran. Hazara visit to Iran are frequent. First, to meet their friends and relatives; second, for the purpose of education, the major part of Hazara are studying in the Iranian cities of Qum of Mashad,to seek employment, to the attend the festivals, the most important of which is Nouroz10 and visit to the Holy Shrines, especially, the Holy Shrine of Imam Reza, the eight Imam of Shia faith.. Pakistan is the world only country from where a maximum number of Hazara pay viist to Iran. They also go to Qum for the purpose of pilgrims and to Tehran to pay their tribute to the late Imam Khomeini. (Najeeb, 2005). The response of the Pakistani Government has been merely a lip service. No even a single person has been arrested so far and brought to justice responsible for these attacks. (The Nation, 8 April,2010).The brutal killing of Hazara and failure on the part of the Government of Balochistan to arrest the culprits and to protect the lives of their citizens created misunderstanding, doubts, and suspicions in the future harmonious and brotherly relations between Pakistan and Iran. As a part of Pakistan’s overall strategy for enhancing its influence in Central Asia and beyond the deep water port that it is building of new Gwader Port in Balochistan with the active Chinese assistance. Pakistan can provide Gwadar port to landlocked CARs. Gwadar can be a potential trade route for the CARs. The trade route can bring a lot of investment to Pakistan. So far the newborn states are relying more upon Pakistan for trade and commercial purposes. This port would have tremendous economic impetus to Pakistan for several reasons. It is located about 250 miles from the Straits of Hormuz through which some (40 percent of the world’s oil supplies Region). Second, the strategic location of the port makes it as an important regional shipping hub, providing the landlocked Central Asian republics, Afghanistan, and the Chinese Xingjian region an access to the Arabian Sea and third it will reduce the distances of 500 km between Pakistan and Central Asia. And more significantly, it will facilitate the transfer of Central Asia’s vast energy resources to world markets through Pakistan with significant profits in transit fees. (Haider, 2005). Chabahar should provide India with access to Afghanistan via the Indian Ocean. India, Iran and Afghanistan have signed an agreement to give Indian goods, heading for Central Asia and Afghanistan, preferential treatment and tariff reductions at Chabahar. For the Indians, this is a direct threat. According to the recent report of Delhi Institute for Defence Studies and Analysis “Gwadar port being so close to the Straits of Hormuz also has negative implications for India’s commercial interest as it would enable Pakistan to exercise control over entire energy routes. It is believed that Gwadar will provide Beijing with a facility to monitor Indian naval activity in the Persian Gulf and Arabian Sea, respectively, as well as any future maritime cooperation between India and Iran. (Global, 2011).Similarly, Iranian officials apprehend that Gwadar would be used by the United States as a base to monitor activities inside Iran. ( Asia Times, April 29, 2005). By virtue of its geo-strategic location, Balochistan occupies a paramount significance in the context of Pak-Iran relations as the only Province which shares direct border with Iran. The province plays a frontline and leading role in Pak-Iran economic and social integration. Integration of Common markets through undertaking infrastructure projects including network of roads and railways would facilitate trade within the region and cross border. The movements of people across the border significantly increase the economic, cultural and social interaction between the people of these two provinces. In the terms of cultural interactions and people to people contacts both the countries have achieved a considerable progress. In International relations, political, diplomatic and economic relations determine the nature and limitation of social and cultural interactions. The relations between Pakistan and Iran in these fields are, in fact, the reflection of social and cultural relationship which existed between the people of the two countries, and this is due to the blessing of the Province of Balochistan. The common characteristics i.e. the homogeneous culture and tradition of the people of these two Provinces will also study the nature of the depth of people to people relations between Pakistan and Iran. It is because, of their common faith, shared interest and common cause that not only accelerate the bonds of friendship between the two countries. The proposed venture in Hub will also go a long way in promoting economic cooperation between Pakistan and Iran, which suffered in the past few years because of political misunderstanding between the two countries over Afghanistan. This will provide an economic impetus to this least developed province Balochistan and offer employment to the Baloch youth where such opportunities are scarce. More important, refinery will help to meet the growing demand of high speed diesel. It will also facilitate oil and gas exploration within the Province. More significantly, the construction of gas pipeline between Iran-Pakistan-India is perhaps, the most positive aspect of the new era of good economic relationship. The proposed gas pipeline project would be advantageous to Pakistan from the economic and political point of view. The Pakistani part signaled as desire to remove imbalances in their trade relations. But, unfortunately, the presence of certain discoursing factors is perpetually and continuously disturbed this friendly, peaceful, and brotherly relations between these two countries. The intensification of sectarian crisis, the lack of information regarding each other’s resources, the wrong economic policies, the absence of effective border Market, border trade barriers, growing problems of smuggling and drugs- trafficking across the border, and other local trade hurdles are some of the challenges and constraints that greatly hampered the relations between these two provinces. Moreover, the Iranian allegations against Pakistan’s government involvement in the Balochistan based Jandullah Organization with the active support and cooperation of USA, and the growing competition between the Pakistani Port Gwader and the Iranian Port Chabahar further added fuel to fire to already disturbed relations.